My friend Dallas chooses a guiding motto, or theme, each January – something she wants to lean into for the year. When she wrote about it at Bacon in 2016, I was intrigued. But it’s taken me until now to do it myself. There’s something about it that seems so wishful, so hopeful – as if we have any control over what lies ahead for us in the new year, what might be required of us, or what might come to seem important. Yet I like the idea of intention. I’ve always liked beginnings. (And sometimes endings, for that matter.) I’ve always loved both New Year’s Eve and January 1st. For the first time, I have arrived at it – my intention – for the year. It’s the result, no surprise, of a couple of books I’ve read. And – you know – life. 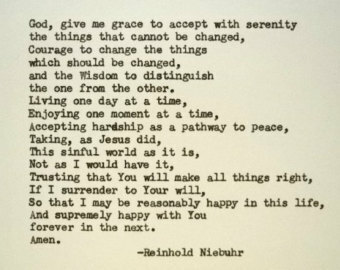 My intention this year is Radical Acceptance. Is that the same thing as giving up, as passivity? As having no intention? Is it lack of vision or courage? I don’t think so, but I’ll let you know if I change my mind. What it means to me right now is this: There is no perfect room to be found in life; there is no perfect self I can be. There is speaking my mind with clarity and generosity – and listening with an open heart and generosity. There is worrying less about imperfect outcomes – while allowing myself to mourn them. There is quieting the mean, hard voice of self-criticism – not silencing it, but quieting it. Two books that have encouraged me to take the Radical Acceptance approach to 2019 were gifts in 2018 – Physical Disobedience: An Unruly Guide to Health & Stamina for the Modern Feminist, by Sarah Hays Coomer, and Thresholds: How to Thrive Through Life’s Transitions, To Live Fearlessly and Regret-Free, by Sherre Hirsch. In some ways, these books could not be more different from each other. Physical Disobedience begins as an angry book, written by a young woman in the aftermath of the 2016 election. It emphasizes the importance of nurturing your own health and strength so you can be politically active in today’s world. The theory is that wellness – caring for yourself – can also be considered physical disobedience in a world that constantly sends unhealthy messages to women. 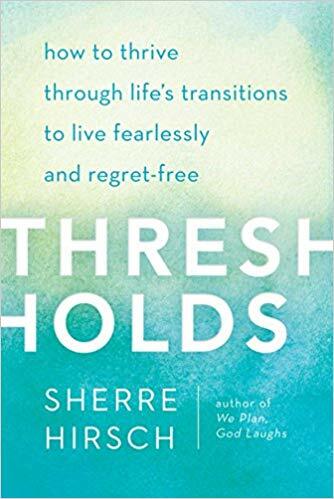 Thresholds, on the other hand, is written by a rabbi and mother of four about transition points in our lives and how to embrace change. It is a gentler read, with references to various Bible stories you’ll recognize, but it emphasizes faith in yourself as you confront life’s hardest passages. Each book is written is conversational style, as if you were sitting down and talking with a girlfriend over a cup of coffee (or two glasses of rose). Once you get past the angry early pages of Physical Disobedience, its message is deeply encouraging: beauty is about purpose and self-care. What you wear should make you feel more like yourself, not squeezed tight. The goal should never be to diminish yourself. Thresholds has a loving and encouraging message throughout: change is inevitable, and though we may fear moving across the threshold into another room of life, embracing the journey – and even unwelcome change – is always the best way forward. There is no perfect room. Both books ask – how can you be a sane, capable, confident person in a difficult world? And they each answer, in their own way – by moving forward, with faith in yourself. With less fear. Strength lies, in part, in discernment, in acceptance. I believe. Sincerest thanks to Marcia Masulla for the gift of Physical Disobedience and Laurie Rice for the gift of Thresholds. The original version of this post runs in this month’s Nfocus. I changed the words a little bit. Deepest thanks to editor Nancy Floyd, as always, for the opportunity. Photos from Sea Island, New Year’s Day 2019. They suggest – I think – the acceptance of encumbrance and hardship and the flourishing of life amongt stone and sand. Jennifer – Happy New Year! I just spoke at a Ravenscroft chapel on a similar concept called My One Word. The idea comes from a book called My One Word by Mike Ashcraft and Rachel Olsen. Their book is written from a spiritual place but the concept can be used regardless of your faith perspective. By the way, my daughter works at Sea Island. She was in charge of all the New Year’s Eve events. 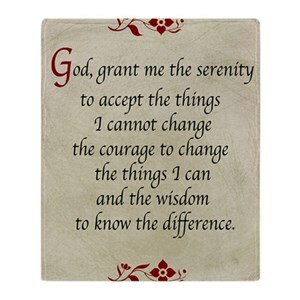 I can always use reminders on how to approach change & challenges. Happy New Year!